Rheumatoid arthritis (RA) is characterized by moderate to severe inflammation of primary joints of the body. 1 out of 100 persons suffer from RA at some point of their entire life. RA is not a genetic disease and may target any individual of any age group (although most cases are reported between 40 and 60 years old). As compared to males, RA is quite prevalent in females. The pathophysiology of rheumatoid arthritis revolves around the hypersensitivity of immune cells to attack the covering of the joints’ membranes, which are called synovium. Immune mediated destruction of joint cartilage leads to an inflammatory response that further contributes to the thickening of joint lining, along with bone and cartilage destruction. With persistent stretching and weakening of the ligaments and tendons, the joints become misshaped and lose their alignment. Joint stiffness, worse in the morning. Aggravated joint stiffness in the morning is the chief sign of most patients who develop RA. Stiffness is worst after inactivity and improves with mild exercise. Most frequently involved areas include feet, ankles, shoulder and knees. Joint swelling. Joint swelling is a common in acute inflammatory response that is often associated with a feeling of tenderness and tension. Joint swelling is reported in acute attacks of RA. Fatigue. It occurs on and off from day to day or week to week. At times it is coupled with feeling of overall poor health or depression. Low grade fever. Low grade fever, with other initial rheumatoid arthritis symptoms such as inflammation and pain in the joint, is a red flag of RA. But temperature above 38°C/100°F may serve as a warning of some other ailment or infection. Numbness and tingling. Inflamed tendons result in damage to nerves which may lead to numbness, burning or tingling feeling in the hands, which is also called carpal tunnel syndrome. With movement, the impaired cartilage pulverizes against the joints causing crackling or squeaking of the joints of feet or hands. Chest pain. The risk of heart failure and heart attack escalates in people with rheumatoid arthritis, because this condition influences the muscles as well as the blood vessels of heart. Difficulty to move hands or feet. This symptom appears rarely, but when it does, it is usually due to damaged nerves in the setting of advanced rheumatoid arthritis. The generated feeling is like as if experiencing a heart attack of nerves. Red spots. When the inflammation of small blood vessels occurs, the tissue suffers irreparable damage that leads to appearance of tiny black or red spots either around or on the fingernails. This symptom also occurs quite rarely, but when it does it indicates that the inflammation has advanced. Eye problems. Rheumatoid arthritis symptoms also affect the blood vessels present within the eyes. This happens particularly in people with the advanced stage of disease. When the outermost layer of the eye becomes irritated or dry, you may use eye drops to overcome this problem. Stomach problems. Problems associated with stomach may result from taking non-steroidal anti-inflammatory drugs like naproxen or ibuprofen for the treatment of rheumatoid arthritis. NSAIDs have the potential to cause ulcers. Be cautious while you use NSAIDs and tell your doctor if you experience any pain in the stomach, nausea or bloody/black stools. Fracture. Bone fracture in patients of RA maybe due to osteoporosis, particularly in women. The inflammation in rheumatoid arthritis may result in bone loss. You should get a bone density test for spotting osteoporosis. Apart from consuming a diet enriched with Vitamin D and calcium, you can also take some moderate exercise. Bruise easily. The possible reasons behind easy bruising is low platelet count, which is a complication of RA. Because aggravation of this symptom may lead to excessive bleeding, consult your doctor immediately and get your platelets count along with other necessary tests. 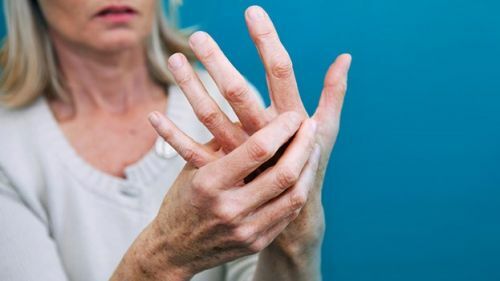 Rheumatoid arthritis remains incurable to this day; however, certain treatment is available to minimize the pain and inflammation and promote the joint functioning, preventing them from getting deformed and destroyed. NSAIDs. They alleviate inflammation and associated pain. OTC (over-the-counter) NSAIDs are naproxen sodium and ibuprofen. Adverse effects may be kidney and liver damage, heart problems, irritation in stomach and ringing in ears. Steroids. Corticosteroid medications alleviate pain and inflammation and slow the damage to the joint. Adverse effects may include diabetes, weight gain, cataracts and bones thinning. Disease modifying anti-rheumatic drugs. DMARDs slow down the RA progression and prevent the tissues and joint from getting permanently damaged. Adverse effects may be severe infection of lungs, bone marrow suppression and liver damage. Physical therapy may be essential to maintain the flexibility of the joints. Therapist will design a program with supporting exercises and new techniques of carrying out daily routine tasks. You may keep your joints from stressing by using assistive devices. Total joint replacement. It involves removal of those parts of the joints which have been damaged, and insertion of prosthesis. Tendon repair. It involves tendons (surround the joint) repair. Joint fusion. A joint may be fused by surgical means if realignment and stabilization of joint is required or for alleviating the pain when replacement of joint is out of consideration. Here are some effective and natural remedies for pain relief. However, consult your doctor before jumping to any natural remedy. Heat and cold treatments. Cold compresses alleviate the inflammation and swelling of joint. Heat compresses cause blood flow stimulation and muscle relaxation. A damp heating pad or warm towel may be used. Tai Chi. Tai chi movement is safe and gentle. The aim of the exercise is to enhance the overall range of motion while strengthening the joints. It can also distract from the pain. Acupuncture. Acupuncture aims on stimulating several targeted points on particular sites of the body. It assists in the restoration of the balance and in enhancing the immune system. It is believed that acupuncture reduces pain by stimulating endorphins and pain blocking chemicals. Omega-3 fatty acid. Fish oil containing omega-3 fatty acids has anti-inflammatory element. Fish oil supplements have the ability to alleviate morning stiffness associated with RA and prevent heart diseases. Meditation and relaxation. Meditation reduces stress and promotes relaxation. It decreases pain perception and normalizes the breathing and heart rate. Magnets. It is available in several forms like disks, pads, inserts, necklaces or bracelets. It is classified as a popular alternate therapy for RA.